In Volume I, “Regency Era” we’ve made it easier than ever for you to learn the basics of English Country Dancing or to add to your dancing repertoire. There’s even an “Introduction to English Country Dancing” video for beginners. Now you can learn these dances from the comfort of your own living room or use it to practice for an upcoming dance. You’ll begin by learning the steps and figures for each of the four Regency Era dances featured on the DVD before we teach the walk through and then demonstrate the dance with music. Our innovative use of on-screen prompts, visual illustrations and dance calls make it very easy to learn even the most complicated dances and figures. Features musical performances by The Assembly Players and Bare Necessities. NTSC, Approx. running time: 50 minutes. Limited Time Offer! Purchase Volume I “Regency Era” DVD/CD Combo, and receive FREE SHIPPING! Note: Actual shipping cost is calculated during checkout. Estimated shipping costs are for orders weighing less than 13oz or 1 – 3 items. Note: Shipping times not guaranteed. Actual shipping costs may vary. for only $10.00 and get FREE SHIPPING! Learn the dances from some of your favorite films! 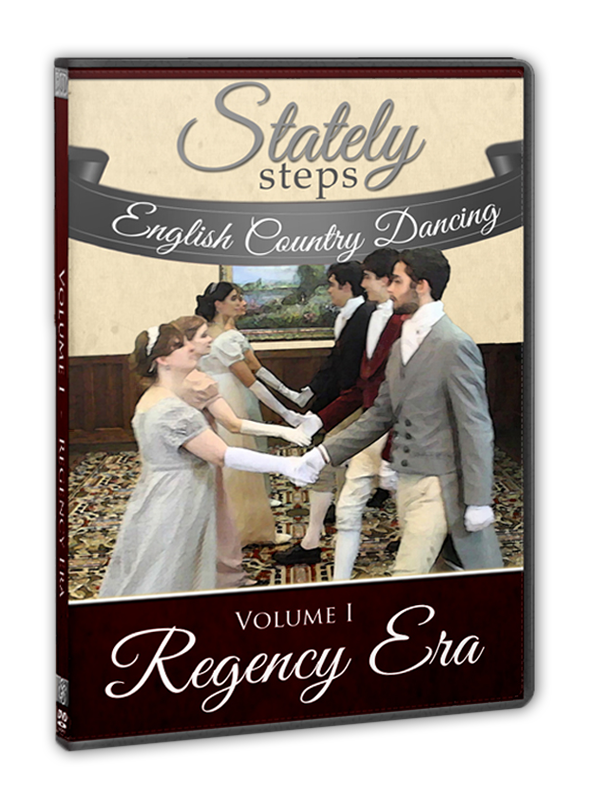 We go through each step of the dance individually, and with our special “Introduction to English Country Dancing” video, you’ll be “stepping stately” in no time! Through an innovative use of walkthroughs and an on-screen prompt, learning dances to add to your repertoire has never been easier. Our “Introduction to English Country Dancing” video will give you a crash course lesson that will you have dancing in no time! You’ll be the first to “form into a longways set”at your next dance event. You’ll learn each step and figure individually – they’re like the building blocks for every dance. Learning the little touches like “giving weight” while turning, or lifting your heels during a skipping step, will polish your dancing style. After you learn the steps for each dance, you’ll put them all together in a walkthrough. Learning a new dance has never been easier thanks to a special on-screen prompt that let’s you stay one step ahead of the game. Now it’s time to put everything together and dance to music! Our dancers demonstrate the entire dance and you and your friends can join in for a dance-along. In “Regency Era” you’ll learn “Auretti’s Dutch Skipper,” “Barbarini’s Tambourine,” “The Hole in the Wall,” and “Mr. Beveridge’s Maggot.” Features musical performances by The Assembly Players and Bare Necessities. NTSC, Approx. running time: 50 minutes. People all over the world love to English Country Dance!